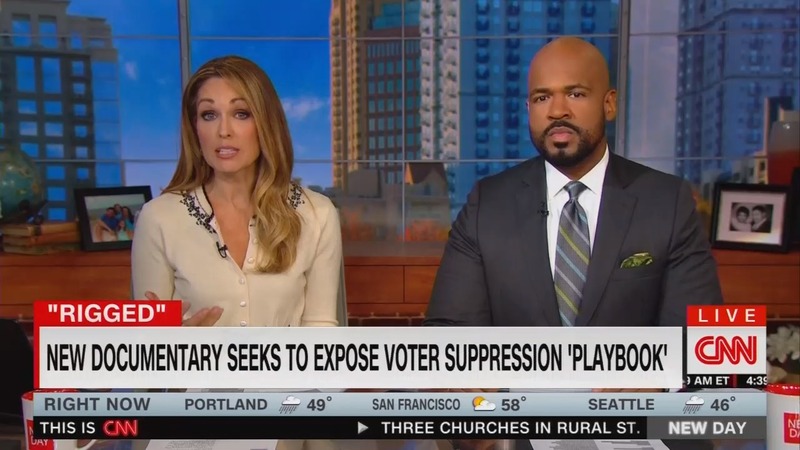 On CNN’s New Day Sunday, co-hosts Christi Paul and Victor Blackwell devoted a segment to interviewing the producers of the liberal propaganda film, Rigged: The Voter Suppression Playbook, which accuses Republicans of engaging in “voter suppression” against minorities to hurt Democrats. The two hosts also adopted the loaded term “voter suppression” and repeatedly employed it during the segment as if it were neutral, proper terminology. As Donald Trump has said so many times, the elections are rigged. But in a much different way than he claims. They’re rigged to stem the rising demographic tide of nonwhite voters and to discourage younger voters. Clearly, the voter suppression playbook is working all too well. Purging voter polls (sic), redrawing districts, adding extra requirements in order to be able to cast a ballot — these are just some of the tactics a new documentary says are part of a playbook they call (sic) Republicans are using to suppress the votes of minorities and the poor. The two CNN hosts then brought aboard Tim Smith and Mac Heller, who co-produced the film, and gave them very little challenge as the two liberal activists made their case against Republicans. Smith began by complaining that he thought that requiring photo ID which 10 percent of voters do not have was the worst out of a list of 10 “voter suppression” methods the film deals with. Your film suggests that it was the election of President Obama in 2008 that really mobilized some well-funded Republicans to start not trying to get out more of their voters, but to get out fewer of the Democratic voters. What was it about that election beyond any other election that Democrats won that really was the catalyst for what you found? Not mentioned was that a number of prominent states that have adopted laws against voter fraud since 2008 were not under the control of Republicans prior to January 2011, so Republicans could not have enacted such actions before President Barack Obama’s election even though such measures were already being discussed by conservatives as far back as 2006. These states include North Carolina, Wisconsin, Michigan, Pennsylvania, Missouri, Virginia, Tennessee and Kansas, which either had Democratic governors or Democratic-controlled legislative chambers prior to 2011. Florida already had photo ID as far back as 2004, and, as recounted by the Heritage Foundation’s Hans von Spakovsky in a speech before Texas legislators in 2009, after Georgia enacted photo ID requirements in 2005, voter turnout increased for the state’s minorities in 2008 over the 2004 election. I know a lot of the voter suppression laws have been blocked by the courts. The last point in your playbook describes an effort to change the courts. President Trump — he’s been working to confirm different judicial nominees. Have you seen or have you been able to identify if there has been any impact thus far? Nearing the end of the interview, a token amount of pushback was offered as Paul posed: “Before we let you go, we have to get some of the other side in here regarding gerrymandering, for instance. I mean, they’ve been having — Democrats have been using similar tactics in that regard as well. One of the cases the Supreme Court is hearing right now is from Maryland. How does that — what do you say to the people on that side of this? The film itself makes it sound as if Republican map makers acted inappropriately merely by asking for data on racial makeup of precincts even though it has been commonplace for race to be taken into account to create minority majority districts at least as far back as the early 1990s. Back then, because it guaranteed a minimum number of minorities would be elected to Congress, African American Democrats supported the creation of such districts, and only began to express reservations after it hurt white Democratic candidates and helped Republicans take other districts.